PLAY IT SAFE. Have a 1.25" margin inside the finished size. Any text and important images runs the risk of being hemmed, grommeted or trimmed away. LET IT BLEED. 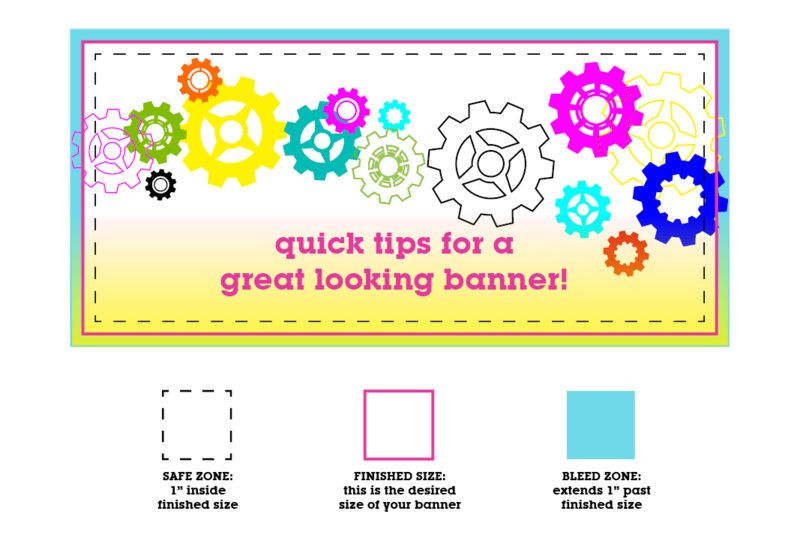 If you have any graphic or color that goes to any edge of the artwork, it's recommended to extend past the finished size at least 1". This will assure you won't have a white edge or frame showing. Note the yellow color and gear artwork above is extending past the pink trim line. KEEP IT SHARP. For best quality, all photos and graphics should be at least 150 dpi. Save your art as a high resolution PDF. NEED A JUMPSTART? Check out our template library complete with margins and guidelines here. For any other questions, don't hesitate to contact us!